That was my attempt to confuse and delight your senses... did it work? Orange-flanked Bush-Robin is another name for a wee Asian flycatcher many British Columbia birders are now familiar with: the Red-Flanked Bluetail (Tarsiger cyanurus). 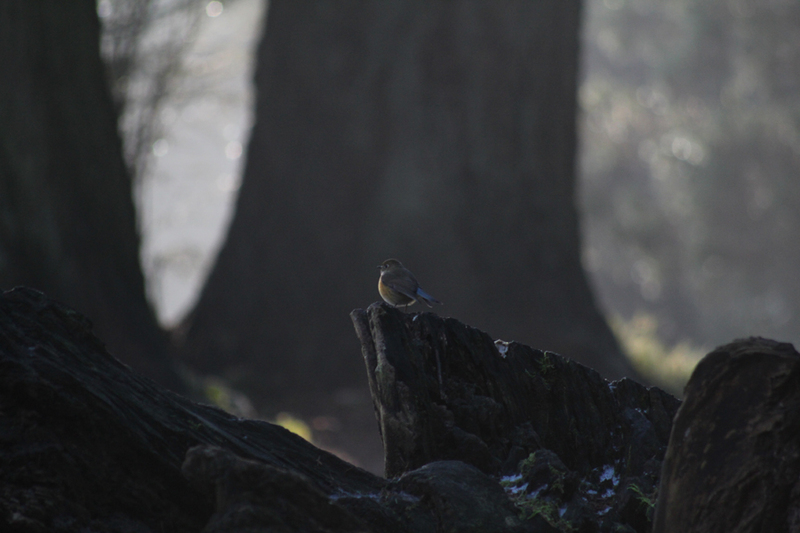 On January 13, 2013, a birder by the name of Colin McKenzie visited Queens Park in New Westminster and saw a bird that had him drawing a blank. He studied the bird and jotted down some detailed notes and passed the information on to George Clulow and Mike Toochin. I am not sure what exactly the notes said, but I envision it being something along these lines: "Small brown-backed bird with red flanks and a blue tail." Regardless of what his notes actually said, it was enough to convince George and Mike that the bird in question was almost certainly a Red-flanked Bluetail. I follow sightings in North America close enough to know this species has turned up on islands off California, including one just over a year ago on San Clemente Island. Every time something of that magnitude turns up in California, I wonder if it had to pass by British Columbia or whether they sneak by hundreds of kilometres offshore. Either way, I always hoped an Asian flycatcher would be turned up in British Columbia some day. Well... it happened! My first chance to try for the mega rarity was January 19, but the Brothers Kimm - Jeremy and Jason - put the invite out to head out on the 20th instead. I accepted and contacted my good friend, Tom Plath, to see if he would be up for picking up three wishful birders at the ferry terminal. Tom was more than happy to oblige, which was great because I have very poor navigational skills on the Lower Mainland. Our plan was set then - Jason would head down from Duncan, pick us up, and we'd walk on the ferry and meet Tom on the other side. A minor hitch the morning of the twitch day came in the form of Jeremy K.'s car rolling up to my place and no sign of Jason. Apparently Jason forgot to set his alarm and woke up around the time he was supposed to be at his brother's place. Jeremy K. wasn't about to let the day go to waste, especially when we had a ride waiting for us on the other side, so he took matters into his own hands. We booked it to the ferry terminal and Jason decided he would still try to make it in time. I am not sure how he did it, but he managed to be the second-to-last walk-on passenger on the ferry. Crisis and guilt averted! Tom was waiting for at the Tsawwassen terminal and he was in good form. He got us down to Queens Park in good time and it was one of those anticlimactic twitches where there is minimal work required to find the target. The paparazzi was on the scene as expected, but it didn't seem like anyone was intently staring at the bird when we arrived. Within a couple minutes of assessing the area, I saw a bird fly in and land at the top of a low perch. I saw a few Red-flanked Bluetails on my trip to Thailand and this bird brought in a flood of memories. The bird was sporting a warm brown back, orange-red flanks, a blue tail that varied in vibrancy depending on the light, a prominent white eyering, and a dingy brown wash the upper chest that was contrasted by its white throat. 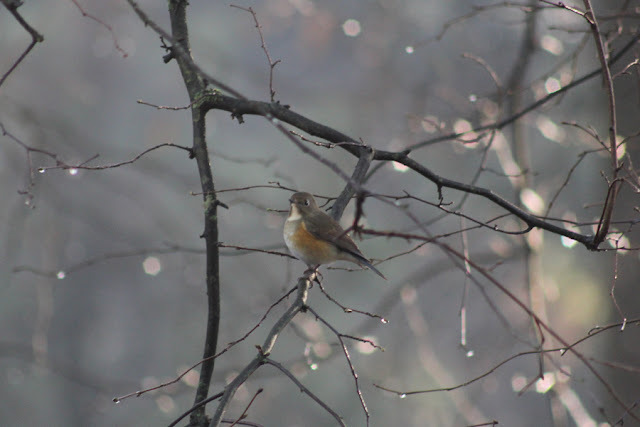 The morning light and slight fog created a rather ethereal setting for the Red-flanked Bluetail. After our entire group had great looks at the bird, we relaxed and spent the next couple hours casually watching the bird, chatting with fellow birders, taking some photos, and shaking our heads at the shuffling, bumbling photo mob. 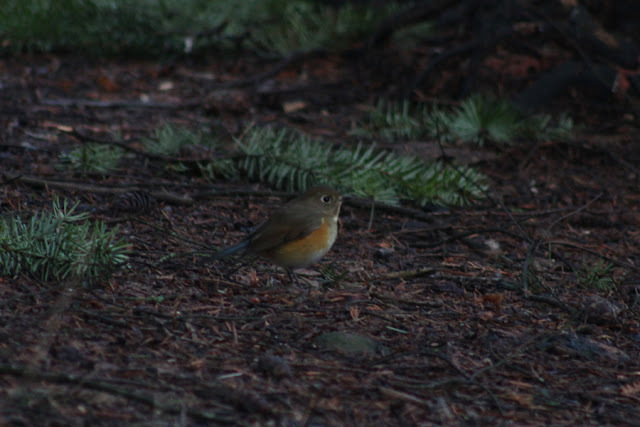 Publicity for birds is a bit of a double-edged sword and the Red-flanked Bluetail was a great example. One one hand, many people learned about this rare bird and were interested in catching a glimpse. This brings about a greater awareness and appreciation for wildlife. The flip side of the coin is the inexperienced masses coming out to catch a glimpse of this Asian vagrant and maybe even get a photo. The end result is a bird that has to work a little harder to stay alive because it is continually flushed by people getting a little too close. Luckily this bird seemid quite adept at foraging and the coldest snap of the winter is likely behind us. I know the whole twitching thing is not for everyone, but it's pretty cool to go see a bird that you'll almost certainly never see on Canadian soil again in your lifetime! I'll wrap this up with a big thanks again to Tom for being the commander-in-chief and Jason and Jeremy K. for being two good twitching buddies. The perfect recipe for a good twitch is seeing the target bird and having good company! A few more pictures of this beauty should be a nice way to finish off this post. The Red-flanked Bluetail stayed in the shadows for the most part, which made getting nice photos very tricky. 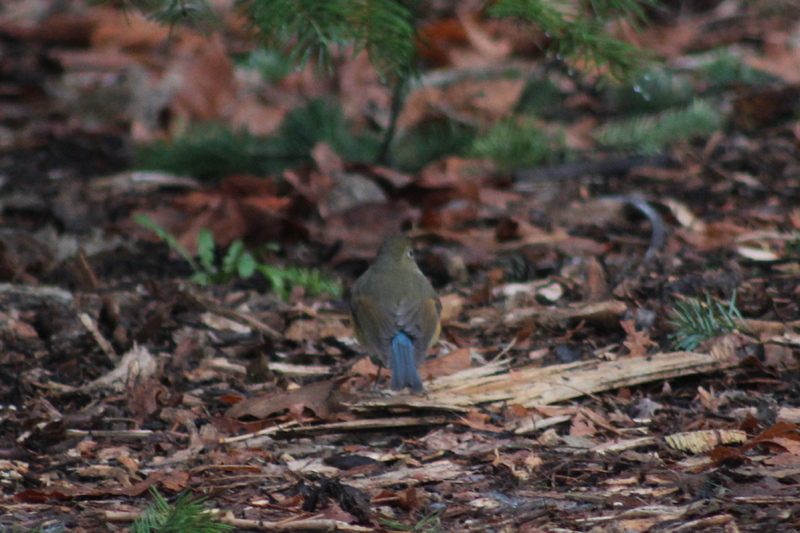 Although not the crispest photo, this shows off the namesake blue tail perfectly. Ooooh... look at that red flank! This photo shows off that contrasting white throat nicely - great bird!